Ignacio’s Caitlyn Chapman (12) attempts to break away from Montezuma-Cortez’s Johana Ruiz during Monday’s game at IHS. The Panthers won 10-0. 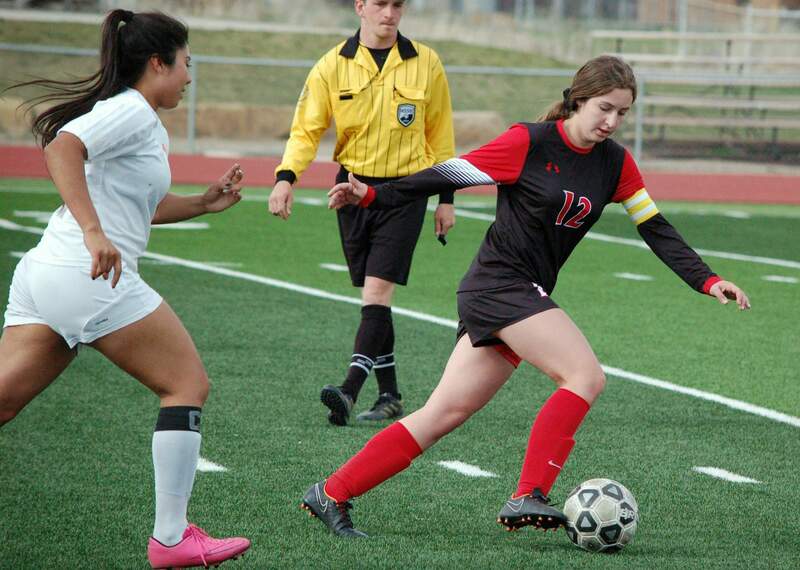 The Ignacio High School girls soccer team lost its third consecutive game and second in a row to Montezuma-Cortez, as the Bobcats fell 10-0 Monday. Montezuma-Cortez (4-3-1, 2-2-1 3A/2A Southwestern League) continued its dominance in a big way from a 6-0 win Friday and got off to another fast start, after the Panthers struck seven times in the first half. M-CHS opened the scoring in the eighth minute when McKenzy Howerton passed to Johana Ruiz, who found the back of the net. Howerton would not be done adding to her point tally, as she scored a hat trick in the first half – in a five-minute span with goals in the 24th, 26th and 29th minutes. It was 7-0 in by the time the halftime whistle sounded. Six minutes into the second half, Tierra Decker scored with an assist from Liz Hughes. Lyndi Belt scored on a penalty-kick in the 56th minute, and Paige Yarborough, who had started at goalkeeper for M-CHS for the first 65 minutes of the match, enforced the mercy rule in the 67th minute. Ignacio (1-6, 1-4 SWL) got another stellar performance from sophomore goalkeeper Rylee Pearson, who made 19 saves, unofficially, after she made 21 in Friday’s match against the Panthers. The Bobcats will travel to Ridgway (1-3-1, 1-3-1 SWL) at 4 p.m. Friday at Ridgway High School. Durango High School girls golfThe Durango High School girls golf team was unable to win its third tournament in a row but did have a top-five finish Monday at the Fruita Monument High School Invitational at Adobe Creek National Golf Course in Fruita, the same site as the regional tournament next month. Durango finished tied for fifth as a team with a 75-over par 294 alongside Palisade. Grand Junction won the tournament with a 46-over 265, while Montrose was second with a 63-over 282. There were 10 teams at the tournament. DHS senior Madalen Meier shot a 16-over 89, which was a fourth-place finish. Grand Junction’s Brittlyn O’Dell had a 2-over 75 on the day to take home the individual title. Lily Tichi was DHS’s second-highest finisher with a 24-over, which was tied for 12th. Faith Mewmaw shot a 35-over and tied for 27th, while Quinn Griswold was tied for 32nd after she shot a 37-over. DHS will host its home tournament, the Durango Invitational, at 10 a.m. Monday at Hillcrest Golf Course.